The birth of an infant sibling is a common occurrence in the lives of many toddler and preschool children. 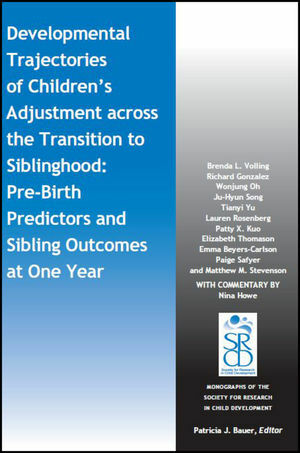 The current study examined individual differences in trajectories of young children's behavioral and emotional adjustment after the birth of a sibling. Growth mixture modeling (GMM) was conducted with a sample of 241 families expecting their second child using a longitudinal research design across the first year after the sibling's birth (prenatal, 1, 4, 8, and 12 months) on seven syndrome scales of the Child Behavior Checklist. Multiple classes describing different trajectory patterns of adjustment and adaptation emerged. There was no evidence of a persistent maladaptive response indicating children undergo a developmental crisis after the birth of a sibling. Most children were low on all problem behaviors examined and showed little change, although some children did experience more pronounced changes in the borderline or clinical range. There was an Adjustment and Adaptation Response for aggressive behavior, indicating that some young children react to stressful life events but adapt quickly. Data mining procedures uncovered various child, parent, and family variables that discriminated different trajectory classes. Children's temperament, coparenting, parental self-effi cacy, and parent—child attachment relationships were prominent in predicting children's adjustment after the birth of an infant sibling. When trajectory classes were used to predict sibling relationship quality at 12 months, children high on aggression, attention problems, and emotional reactivity engaged in more conflict and less positive involvement with the infant sibling at the end of the first year. Emma Beyers-Carlson, M.S., is a doctoral student in Developmental Psychology at the University of Michigan. Her research interests center on typical and atypical families and how family members interact in systemic and interrelated ways. Specifically, her work focuses on how the interconnected relationships in the family system impact prosocial development in early childhood. Richard Gonzalez, Ph.D., is Professor of Psychology, Statistics, and Integrative Systems & Design; Research Professor in the Research Center for Group Dynamics and the Center for Human Growth and Development, and Director of the Research Center for Group Dynamics. He is also Director of the Biosocial Methods Collaborative. His research is in the area of judgment and decision making. He is interested in applied statistical models, longitudinal designs, data mining techniques, and research designs that integrate biological and behavioral processes. Patty X. Kuo, Ph.D., is currently a post-doctoral research associate in the Department of Anthropology at the University of Notre Dame. She received her Ph.D. in Developmental Psychology at the University of Michigan. Her research interests focus on father involvement in families with infants and young children from a biopsychosocial perspective. Wonjung Oh, Ph.D., is an Assistant Professor of Human Development and Family Studies at Texas Tech University. Her research focuses on the role of individual, relational, peer, and family factors in developmental trajectories of adaptive and maladaptive social behavior and relationships. She actively seeks novel, innovative approaches to basic and applied research questions pertaining to developmental and family processes across various transitions. Lauren Rosenberg, M.S., is the Project Coordinator for the Family Transitions Study. She received her Master's Degree in Developmental Psychology from Teacher's College, Columbia University and her undergraduate degree in Psychology and Women's Studies from the University of Michigan. She has interests in early childhood and family relationships. Paige Safyer, M.S., M.S.W., is a doctoral student in Developmental Psychology and Social Work at the University of Michigan. Her research focuses on infant social-emotional development within the parenting context. She is also interested in interventions that strengthen the parent-infant attachment relationship. Ju-Hyun Song, Ph.D., is currently a post-doctoral fellow in the Department of Psychology at the University of Toronto. She received her Ph.D. in Developmental Psychology from the University of Michigan. Her research focuses on the roles of children's social-emotional and social-cognitive characteristics for the development of prosocial behavior and aggression. Matthew M. Stevenson, Ph.D., is a Postdoctoral Research Fellow at the Center for Human Growth and Development at the University of Michigan. He received his Ph.D. in Clinical Psychology from Arizona State University in 2014. He is interested in the role of fathers in child development and developmental psychopathology. Elizabeth Thomason, Ph.D., is a data analyst for the Depression Center in the Department of Psychiatry and a lecturer in the School of Social Work at the University of Michigan. She received her Ph.D. in Psychology and Social work from the University of Michigan. Her interests center around women's depression in the perinatal period. Brenda L. Volling, Ph.D., is Professor of Psychology, and Director and Research Professor of the Center for Human Growth and Development at the University of Michigan. Her research focuses on the role of family relationships for early social and emotional development. She is the Principal Investigator of the Family Transitions Study, a longitudinal investigation of child and family functioning after the birth of a second child, which provided the data for the present monograph. Tianyi Yu, Ph.D., is an associate research scientist at the Center for Family Research, University of Georgia. She received her Ph.D. in Human Development and Family Studies at Auburn University, and was a former post-doctoral fellow on the Family Transitions Study. Her major research goal is to identify factors and processes associated with resiliency and vulnerabilities in children as well as young adults who experience family stress and transitions. Nina Howe, Ph.D., holds the Concordia University Research Chair in Early Childhood Development and Education and is a Professor in the Department of Education, Concordia University, Montreal, Quebec, Canada. Her areas of research include relationships (particularly sibling pretense, conflict, teaching, imitation), the social-cognitive development of preschool and school-aged children, children's play, and early childhood education.